“Ruby said I’d never drown – not in the deep ocean, not by the shipwreck, not even by falling drunk into someone’s bottomless backyard pool … It sounded impossible, something no one would believe if anyone other than Ruby were the one to tell it. But Ruby was right: The body found that night wouldn’t be, couldn’t be mine. Chloe’s older sister, Ruby, is the girl everyone looks to and longs for, who can’t be captured or caged. After a night with Ruby’s friends goes horrible wrong and Chloe discovers the dead body of her classmate London Hayes floating in the reservoir, Chloe is sent away – away from home, away from Ruby. It has been weeks since I finished reading this. Literally, weeks, and I still have no idea how to explain it? Is it contemporary, or is it paranormal? Or is it a mixture of both? This mess of a masterpiece leaves you thinking, literally, for weeks on end. Chloe discovers fellow classmate, London’s body in the reservoir and is quickly stowed off to her father’s, leaving her best friend and sister, Ruby behind. Two years later, Chloe is back, and things are very different. So different that London has managed to come back from the dead. I have no idea of what I think about the plot. The plot is so many things, and yet so few things as well. It’s a basic story of sisterhood, yet the underlying themes and added extras to the story make it so much more (and even more confusing). Despite having no real idea about the plot, it was an enthralling read that enchanted my eyes every single page of the way. I’ll admit that at first, I really didn’t like Chloe, or Ruby. Both of them really, really annoyed me. Chloe seemed like the typical tag-along little sister, and Ruby just seemed stuck up, and both really frustrated me to no end. But their development was astounding and once I better understood them, it was much more intriguing. Despite the fact that I still had issues with Chloe by the end of the book, her whimsical narration was powerful, as well as unforgettable. This leads me on to the writing. The writing, much a like Wither is so very lyrical. Executed beautifully, and quietly compelling, the writing was something out of a fairy tale with a very subtly haunting undertone. There’s really no other words for it except hauntingly lyrical. This novel, in all its plotting mess, is a mesmerising and poignant read. 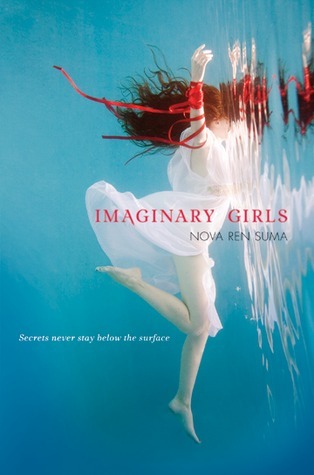 With its strange characters, and off-kilter attitude, Imaginary Girls is an insanely good read for the weird. Or, really anybody.